The RadRadialGauge control allows you to display the scale's range in a radial form. The following example shows a RadRadialGauge's basic set up. 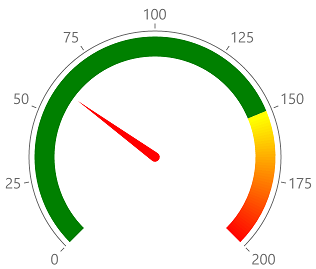 A sample Radial Gauge example can be found in the Gauge/GaugeTypes folder of the SDK Samples Browser application. The radial gauge allows you to define the radius of its axis. This can be done via the AxisRadiusFactor property of RadRadialGauge. Read more about the property in the Positioning help article. StartAngle: The start angle determines the origin position of the axis. SweepAngle: The sweep angle defines the size of the axis' arc. For example, if the start angle is 90 and the sweep angle is 30, the axis will be drawn between the 90th and 120th angle. If the sweep direction is counter-clockwise, the axis will be drawn between 60 and 90. SweepDirection: You can use this property to set the axis sweep direction - clockwise or counter-clockwise.